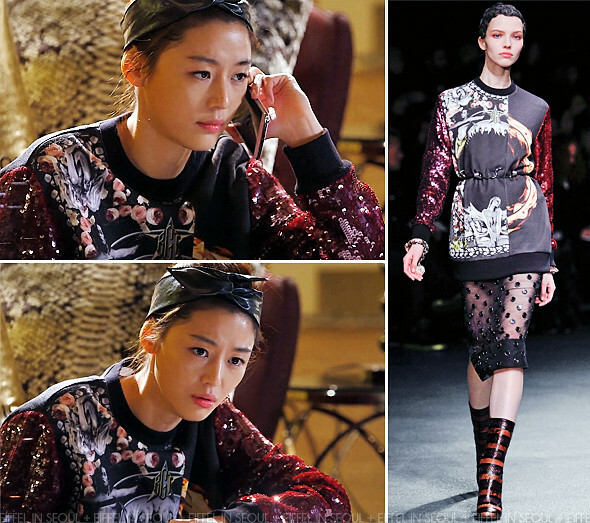 In episode 1 of SBS drama, 'My Love From The Stars (별에서 온 그대)', Gianna Jeon Ji Hyun (전지현) was seen wearing a fuchsia sequin sleeve printed sweatshirt from Givenchy Fall/Winter 2013 collection. Her look was completed with a leather headband. I personally loved this casual look on her. The sequins on the sleeves are beautiful. I enjoyed Gianna Jeon Ji Hyun (전지현)'s performance in the first two episodes of the show. Have you caught the series? The actress was also seen wearing Celine in the same episode, click here to see post.